The Ricky Stator 8" HID Race Light and High Output Stator are typical of the high quality we've come to expect from RS. The 50 watt HID light has been described by a forest service fire spotter, at a distance of 30 miles, as "an object of interest." 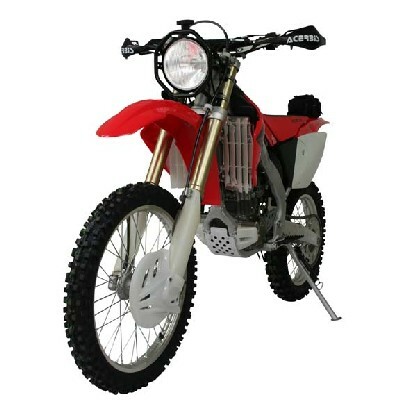 At approximately 100 lumens per watt the 8" Race Light provides a total output of about 5000 lumens. Daytime is about 10,000 lumens per square meter. The light, frame and ballast are remarkably lightweight for their sturdy heft. The frame is powdercoated black and comes with a wiring harness and switch. The back of the light is coated black and light leakage is non-existent around the bulb or anywhere else. The unit is sealed and no water has penetrated the housing in spite of numerous stream crossings, mud bogs, rainstorms and car washes. The aiming knob on top is sturdy and easy to operate. Fit and finish are first rate. Numerous encounters with trees and rocks have us convinced that the entire assembly is bulletproof. We had the stator and rectifier installed at Pocatello Power Sports. 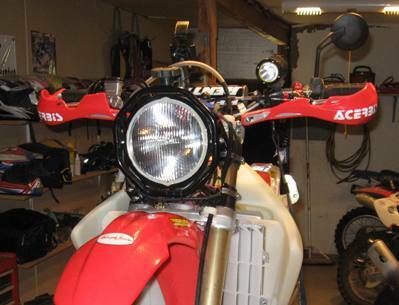 The HID system requires 50 watts DC so the stock stator on the CRF450X had to be replaced (we kept the stock 35-watt halogen light, installed a switch, and use it for general riding). We installed the RS light and wiring harness ourselves and found the installation to be straightforward except that there is insufficient clearance between the back of the bulb and the steering damper on a 09 CRF450X to prevent the wires from being pinched (we shimmed the mounts with some poly pipe to fix this). There were some problems with the ballast and stator of the first system we received but Ricky Stator took care of everything and we've had zero problems since. Our RS light continues to work in spite of dunkings, high-speed getoffs, a head on collision with a tree and numerous encounters with rocks (flying and stationary). We are are well-pleased with the color temperature, beam pattern and durability of the Ricky Stator HID light. In conjunction with two Trail Tech SCMR16 HID lights we've blazed many holes through the night. We cannot recommend this system highly enough. 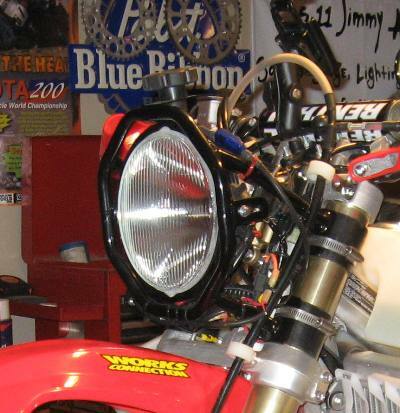 Note: The 8" HID Race light is not currently listed on the Ricky Stator website although they have a few in stock. Rating: The future's so bright we gotta wear shades.